Sabermetric Research: Will taxing the rich improve democracy? But, the most obvious one: are the authors really saying, with a straight face, that a tax on the rich will make them less politically active? No, not at all -- it's that they are saying a tax on the rich will make them less politically effective. And given that in our system, $ = speech (as per the supreme court, for example), then that's basically a tautology. And your race analogy is a big fail. First, you've read the history of race in this country incorrectly -- public opinion was against integration, except for a small vocal minority, and the party that stood up for equality - the Democrats - suffered enormously for it for decades in the South. And you also conveniently missed that time before the civil right era where money and economic interest kept a slave system in place for decades. Big picture, even most conservatives will agree that the gov't has a role in shaping the economic landscape in this country (you're not arguing the contrary, are you?). So, it's just a matter of figuring our your number -- how tax policy, subsidies, minimum wage, and all the other govt' levers should be set -- to obtain the optimal outcome. It's not a philosophical argument anymore, it's a practical one. And the past 30 years of having the levers set one way, with the present outcome, have led me, and most Americans, to the conclusion that the levers need to be set back to how they were in the 60s and 70s - that things aren't working out right anymore. I'm arguing that a tax on the rich will make them politically MORE effective. They'll have less money, but they'll be better organized, and more motivated. Actually, it doesn't matter much how much money they have. If they can influence a politician for $100,000, and thereby gain $150,000 in tax breaks, they'll do it, regardless of their marginal tax rate. What this proposal does is put rich people's tax rates in play as a political football (whether higher or lower). It creates an incentive for lobbying. Even if it's absolutely right to raise taxes on the rich, as soon as you start considering it, you provide the incentive for the rich to start lobbying. To add somewhat to mettle's point about taxing the rich, you also seem to be skipping over the other side of the equation. Even if the rich become more motivated or organized, they will have to compete (with fewer dollars) against suddenly richer middle/lower class folks who are, presumably, already motivated and organized (otherwise such a measure would never pass). The rich would still have an advantage in total dollars, but that advantage will have shrunk in every area on which the rich and not-rich disagree on policy. As a more general point, if income inequality was smaller in the past, you can't point to it and say that good things can still happen. They may have happened because inequality was smaller then. One can argue, maybe racial measures passed then because inequality was at a reasonable level but sexual preference measures have trouble now because inequality has grown. There are so many factors at play, hard to make a firm claim in any direction. This is a bit of a strange point for a commentary - especially for this site. Mish-mashing dissimilar examples for social movements that are not quantifiable doesn't make a lot of sense. Perhaps that's the point, I'm not sure. You also cherry picked your examples. I think if you dig a little deeper into US policies wrt issues that pertain to businesses or issues likely to affect the wealthy (regulations, cap & trade, etc. etc. etc.) I think you can find the influence of the wealthy. Also, the fact that the US does NOT have social healthcare, an example right at the tip of your fingers, is perhaps one of the most easy to observe results of large dollars influence. As for the Op-ed -- I think it was mostly a joke - but consider the media conglomerates in the US. 100% of the highly circulated op-ed writers are employed by extremely wealthy. "Even if it's absolutely right to raise taxes on the rich, as soon as you start considering it, you provide the incentive for the rich to start lobbying." WTF? Isn't the premise of the original NYT post, and your critique, that the rich already lobby? I thought we were operating on that assumption already. So how does considering a new tax on the rich "provide the incentive" for them to start lobbying? Don't we already agree they already have plenty of incentive to lobby? I also don't agree with the subjective notion that if I get $1 million in tax breaks, for example, and then it gets knocked down to $500k, that I'm somehow now more incented to lobby than I was originally. If we're looking at tax breaks as a percentage, cutting my tax rate in half to get me back up to $1 million is far less effective than lobbying to cut my tax rate in half when that would move me from $1 to $2 million. But this is so subjective it's kind of silly to argue about it. Please feel free to ignore my comment. I read through Phil's original post he linked to, and the comments, and there's nothing I'd bring up that hasn't been brought up before. *Some* of the rich currently lobby. Most do not. I should have said that the tax provides *more* incentive to lobby. I'm not in the top 1% (although I wish I were). I've been in the top 10% some years. I don't donate to political parties or candidates. But, if political party X tried to put a special "10 percenter" tax on me, on the grounds that my income is somehow detrimental to democracy, you can bet that I'd certainly consider donating to the opposition, or at least to a lobbying organization. Here's a thought experiment. A conservative President talks about legislation to ban gay marriage. Do contributions to gay lobby groups go up, or down? It's obvious they go up, isn't it? I bet you'd find a strong correlation if you had data. What this proposal does is put rich people's tax rates in play as a political football (whether higher or lower). Phil, their tax rates are already part of political football. They may always have been; my political consciousness goes back only a few decades, and they certainly were part of the equation since the 80s. This sort of reminds me how when rich people lobby and get lower taxes (as they have been for at least 3 decades) it's just how thing work, but when egalitarians propose increasing taxes on the rich, it's all of the sudden called class warfare. Essentially you seem to be arguing as though history started yesterday. 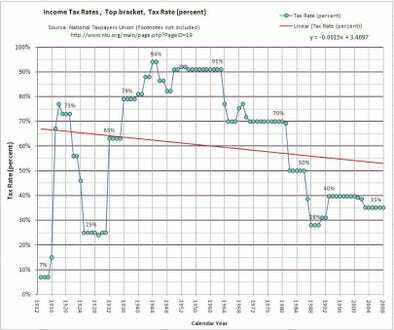 Yes, tax rates are already part of political football. You, and I, and Ayres and Edlin already agree about that. My argument is that special taxes on the rich will make them a BIGGER part the political football. Ayres/Edlin are arguing that the tax will make them a SMALLER part of political football. I am arguing that BIGGER is the correct answer, even if it is absolutely the right thing to do to impose a "Brandeis Tax". That is the point I am arguing here. You seem to be arguing for higher taxes. I am not arguing that higher taxes are bad, at least not here. I am arguing that the proposed new tax, whether fair or unfair, RAISE the political involvement of the rich, not lower it. My view is pretty straight forward, and I think is the null hypothesis: Higher taxes means less income. Less income means less money available to spend on politics. So, your view adds in another factor to the equation: motivation. To make the case, I think you need to show, first, that this does happen. I've seen data where high-income folks are generally pretty maxed out in terms of political activity as it is, so I don't think there's room to grow. Second, you also need to show that this effect is greater than the effect above. I don't think you've done either. Right, I haven't formally done either. Let me try one more argument. People are only politically active when they think they can gain something. Rich people might spend money agitating for $10,000 lower taxes, but they won't spend money agitating to be allowed to rob a bank each year, even though bank robbery will net them much more than $10,000. That's because, in the first case, they have a chance of success, but in the second, they don't. Basically, if you're rational, you'll spend money if the expected value of the outcome is greater than the amount you have to spend. A smart one-percenter knows the chance of a tax cut is small. Maybe there's a 1% chance of getting a $100,000 tax cut. Influencing the politician makes that chance a little bigger: maybe 1.01% instead of 1%. That's worth a $10 contribution. But, now, the Brandeis tax is being debated. It's being taken seriously, and has a 50% chance of being passed (or repealed, if you like -- works either way). Now the contribution will net 1% of 50% of $100,000, which is $500. NOW the rich guy jumps into the fray with $500 worth of agitation, instead of just $10. Maybe you're thinking that rich people spend SO MUCH on politics that a bit of extra tax will force them to cut back. I doubt it. First, the amounts are very small relative to their income (but show me otherwise!). Second, they contribute proportional to their expectation of gain. If you can buy a $20 bill for $10, you're not going to do so regardless of your current income. Yet as taxes have gone down over the past 30 years on the rich, the more money has gone into politics. The rich (upper 1% and corporations) have been spectacularly motivated by the fact that money begets money. So I could argue lowering taxes is only going to incentivize them more to get more goodies. And woe to us who can't pay to play. Especially now since money is speech. 1)"We believe that we have reached the Brandeis tipping point. It would be bad for our democracy if 1-percenters started making 40 or 50 times as much as the median American." I perused all the links to the op-ed and freakonomics posts but did not see anywhere that they gave any supporting evidence for this tipping point. Am I just missing it? It's possible that we are close to a point of no return where oligarchy will replace democracy, but I'd sure like to see some empirical evidence that a 40-1 ratio is where that happens. 2)Tangential thought: It's perverse that so much of the response to the rising GINI and grotesque level of corporatism under Obama has been calling for higher taxes, more laws/greater enforcement, and more regulatory power for the government (and, in the form of OWS, the response has largely been explicitly socialist). You've got a classic public choice issue here, and these answers completely ignore it. If the problem is the nexus between government an increasingly wealthy & influential elite, then increasing revenues and regulatory power for the government serves to exacerbate the very problem you are trying to mitigate. With more money to dole out and greater power to pick winners and losers via regulation and subsidies, the top 1% will be spend that much greater effort making sure that power is wielded in their favor. If, OTOH, you get rid of large amounts of govt spending and power, the rich will have nothing to lobby for and will be forced to spend their money in ways that benefit the public in order to generate a return on it.